Ahh the winged eyeliner, the perfect companion to a red lip, and one of our favourite ways to doll up like a Siren. Winged eyeliner is tricky to master at first, but with practice, you will have that flick down in no time! Different wing shapes and sizes can create different looks, from a prim and petite flick, to a huge and dramatic 1960s wing. Although everyone has different shaped eyes, the cat eye suits everyone! You just need to play with angles, line thickness and wing size. There are many different kinds of eyeliner that you can use. I would recommend using a liquid or gel eyeliner rather than a pencil, as this will create a cleaner, sharper line. Liquid eyeliner either comes in a small pot or tube with a brush applicator, or it can come as a felt-tipped marker. Gel eyeliner usually comes in a small pot, and you use a fine, angled brush to draw in your line. Experiment with different products, and find the one that works best for you! Below is a tutorial for creating a basic winged eyeliner. You can play with these basic steps to try out different looks and eyeliner shapes to find your own style. Winged eyeliner becomes much easier with practice, so the more often you attempt it, the easier it will become. It takes me less than 30 seconds to do both my eyes nowadays, so with perseverance, I know you can nail it too! Disclaimer: I am an amateur make up enthusiast/not a trained make up artist. This is the method that works for me, but there are many different ways to achieve this make up look. Start with your eye shadow done. For a day look, I like a soft peachy colour as a base, with a little bit of a warm brown in my crease. If I was taking this look into the evening or for a show, I like to darken my crease with a charcoal shadow, and highlight the lid with a shimmery white or gold. Starting in the middle of your eyelid, draw a line along to the outer corner, keeping as close to the lash-line as possible. I like a fairly thick line, but this will vary depending on your brush and your preferences. If you find one long line tricky to do, try drawing in the line with smaller strokes. Now draw a line from the inner corner of your eye to meet the line in the middle. Start very small in the corner, widening the line to meet the other. I find doing this part second is easier as I can control the amount of product on the brush more easily. It's time to draw in the wing! Hold your brush against your face so that it aligns with the corner of your eye and the end of your eyebrow - this is a great angle to start out with when drawing in your wing. If you find this angle isn't for you, you can always play with different shapes and sizes. 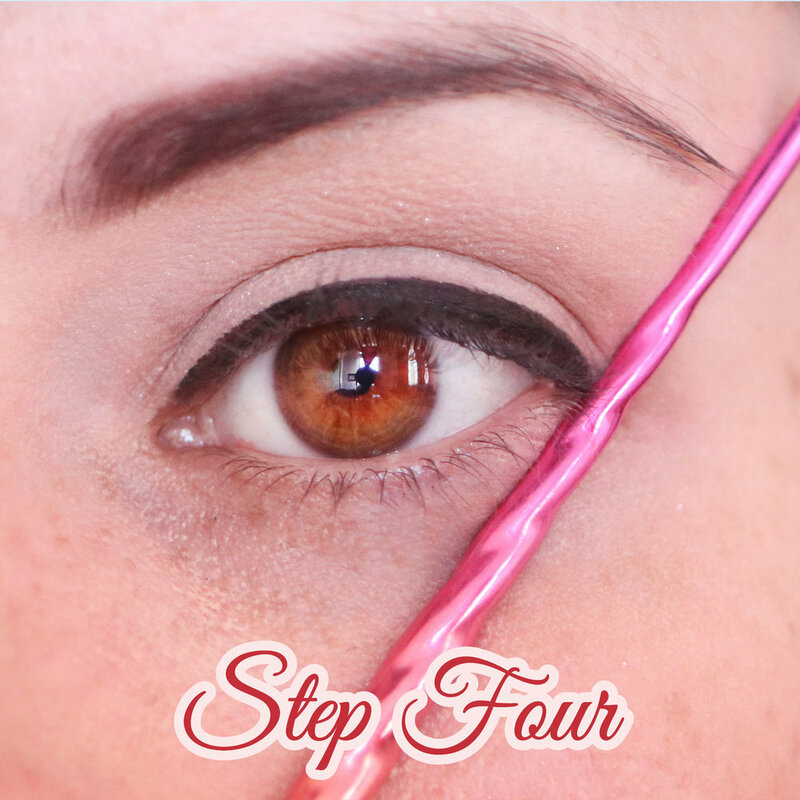 Draw a line from the corner of your eye, extending up towards the edge of your eyebrow (or in whichever direction you like.) The length of this line will depend on how long you'd like your wing to be. Simply add some red lipstick and a sweep of powder and you've got the perfect pin up look! If you want to take this look from day-time vintage to show-stopping vixen, try a larger wing. You can even use a glitter liner on top of your black line for some showgirl sparkle! Meow! Your feline eyes are complete! If you give this tutorial a try, make sure to post your sultry look on Instagram and tag us at @skysirens!